The Toyota HiAce (pronounced as "High Ace") is a light commercial van produced by the Japanese automobile manufacturer Toyota. First launched in October 1967, the HiAce has since been available in a wide range of body configurations, including a minivan/MPV, minibus, panel van, crew van, pick-up, taxi, and an ambulance. In Japan, the HiAce is exclusive to Toyopet Store locations. Introduced in 1967, the HiAce was offered as a cab over pick-up, delivery van, and a stretched commuter vehicle. It was also called the HiAce Commercial in camper van configuration. 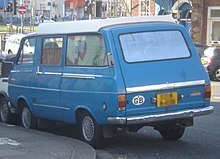 It was brought to market two years after the introduction of the Nissan Homy, acquired by Nissan when they assumed operations of the Prince Motor Company. A few engines of different sizes were available upon introduction, ranging from the 70 PS (51 kW) 1.35 to a 83 PS (61 kW) 1.6-liter version. In 1975, the 1.8-litre 16R engine was added. The HiAce was available with a heater, considered a luxury item at the time. The HiAce was primarily designed as a commuter vehicle, able to transport up to 8 people. 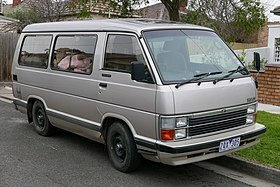 With this goal in consideration, the HiAce exterior dimensions and engine displacement were in compliance with Japanese Government regulations so as to encourage sales, and accommodate the most passengers by utilizing a cabover body style, with the engine installed underneath and between the front passengers. It was a smaller alternative to the larger Toyota Coaster minibus, and was introduced to Japan after the 1950 Volkswagen Transporter, and the 1961 Chevrolet Greenbrier cabover vans. It was introduced in the same year as the much smaller Toyota MiniAce, which was based on the Toyota Publica, a predecessor to the Toyota Corolla. This type of HiAce is a rare model these days mostly because of weather wear and rust. HiAce vans originally sold on the European market have largely been exported to Africa and to Southeast Asia where they are used as public transport vehicles. In Sri Lanka, this is known as the Rukmani model because popular actress Rukmani Devi had a fatal accident while driving one. 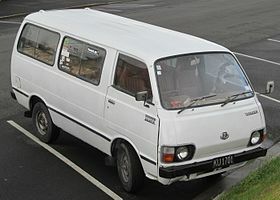 The new HiAce of 1977 featured a longer, and more streamlined cab with single headlights. As the second generations dimensions grew, it was joined by a smaller, junior-level cabover van called the Toyota LiteAce to continue to offer dimensions closer to the first generation. In addition to the petrol engine, a 2.2-litre diesel engine was offered in certain markets. New for the "20–40 series" HiAce was a double-cab pick-up, super-long-wheelbase van, and a super long, high-roof Commuter. The Commuter models can seat up to 15 passengers. The short wheelbase truck initially carried the "H11"-series chassis codes. For the vans, 20 series vans have short wheelbases, 30 series have long, and 40 series have super long wheelbases. After the third generation was introduced in 1982, certain variants of the second generation continued to be manufactured for several years. Majority of the second generation models were exported to African and Asian countries after production ended and are used as public transport vehicles. A new HiAce van was launched in 1982, with the HiAce pickup truck coming in August 1985. The truck's cab design was common to the bigger ToyoAce light truck, though it had different frontal styling. The truck was a completely different model than the van. The van's model number contains various wheelbase specification information: 50 series vans have short wheelbases, 60 series have long, and 70 series have super long. The pick-up trucks are in the 80 and 90-series. The Toyota Mobile Lounge, displayed at the 1987 Tokyo Motor Show, is based on the HiAce high-roof Commuter. While the van and Commuter were redesigned in 1989, the pick-up was produced til the 1995 model year, and was the last HiAce based pick-up. Air-conditioning was offered as standard equipment on some variants from this generation onwards. The fourth generation model appeared in mid 1989 and was available in standard wheelbase and long wheelbase variants; a Grand Cabin; standard wheelbase and long wheelbase van; long wheelbase and super long wheelbase high roof van. The latter shares a body design with the Commuter, which is a 15 seat minibus. A range of engines were available in the 4th generation vehicles, ranging from 2.0-litre petrol engines to 3.0-litre turbo diesel engines. Most versions are rear-wheel drive, but part time or full time four-wheel drive versions were sold depending on specification level and market. The base model is typically the DX. Upmarket versions included CD, GL, and super GL models. The facelifted fourth-generation HiAce was launched in May 1994. The HiAce received facelift again during 1997 and once more in 2002. In the Philippines, the HiAce was first sold in April 1995 with a diesel engine, getting revamped in May 1997 as it went from business status to family van status. In March 1999, the HiAce Grandia and 2.0 GL gasoline HiAce variants were launched, as well as the HiAce Commuter, a HiAce meant for business, and the HiAce was facelifted again in that year. In June 2001, the top-of-the-line 3.0 inline-4 diesel HiAce Super Grandia was launched. All came with a standard 5-speed manual transmission. These variants were all sold until June 2005, with the next generation being launched in June of that same year. A special edition HiAce Super Grandia J (Japan edition) was also sold together with the RAV4 J and Revo J from August 2002-June 2003. The HiAce was rebadged with a luxury orientation, called the Toyota RegiusAce. It was introduced in August 1999 with different versions called the Regius HiAce and Regius Touring HiAce sold at Toyopet and Vista dealerships. The RegiusAce uses a cab-over layout, meaning that front seat passengers sit on top of the front axle and the 1TR-FE engine is located underneath the floor and between the front passengers. When the Vista sales network was replaced by the NETZ sales network, the Regius Ace was sold exclusively at the Netz Store. The first generation H100 series was manufactured between 1999–2004. The HiAce (H100) also remains popular in China, where it is still produced by Jinbei Motors, King Long Motors, and Foton Motor Company amongst others. These are exported to several markets, including Chile, and are also assembled in both Egypt (by Bavarian Auto Group) and Sri Lanka (as the Micro MPV J). Common engines found in Chinese Hiace variants are the 2.0 and 2.2-litre (491Q-ME) petrol engines and the 2.8 litre diesel engine. A Chinese variant of the 2.4 L 2RZ-E engine is also available known as the 4RB2. The Isuzu 4JB1 engine and other engine names such as the V19, 4G20C and the 4G22 are available in China as well as 2.5 and 2.7 litre diesel engines. Sold in the Japanese market between 1995 and 2002, the Granvia is a semi-bonneted van, with the front wheels positioned in front of the front seats for better safety. Available with seven- and eight-seater configurations and in two-wheel drive or four-wheel drive, it is based on the regular HiAce. 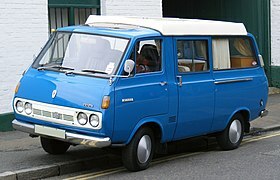 Because of tighter safety regulations, this model replaced the mid-engined HiAce in Europe and several other markets. The engines for Granvia are either a 2.4 L or 3.0 L diesel, or 2.7- and 3.4 L petrol. The Granvia spawned into the upmarket multi-purpose vehicles the HiAce Regius, the Grand HiAce and the Touring HiAce. The Granvia, Grand HiAce, and Touring HiAce are upmarket passenger vans only. The Grand HiAce was based on the HiAce Powervan. Sales of the Grand HiAce started in Japan in 1999. Engines available were a 3.4-liter petrol and a 3.0-liter turbo diesel. This type was sold in Japan only until 2002. In Taiwan the Granvia was badged "Toyota HiAce Solemio". The semi-bonneted HiAce was sold in Norway and was the best selling van for many years until early 2012, when it was withdrawn from the market. The Hiace sold in Europe was replaced with a rebadged version of the Citroën Jumpy/Peugeot Expert/Fiat Scudo which is sold as the Toyota ProAce. It's made in cooperation with Jinbei as the Jinbei Granse (阁瑞斯 Geruisi) or Grace in English. The fifth-generation of the HiAce became available for sale in late 2004 as a wide long-wheelbase wagon, wide super-long-wheelbase high-roof "Grand Cabin", long-wheelbase van, long-wheelbase high-roof van and a wide super-long-wheelbase high-roof van. In this generation of the HiAce, the gear lever has been moved to the dashboard to enable easier movement in the cabin. Transmission choices range from a Five-speed manual and four-speed automatic. Most models use a four-cylinder DOHC engine, in a variety of forms, a 1TR-FE 2,000 cc or 2TR-FE 2,700 cc petrol engine, or a 2KD-FTV 2,500 cc or 1KD-FTV 3,000 cc D-4D turbo diesel engine. Two of these engines are available in Malaysia, the 2.5 L turbo diesel, offered in a choice of panel van or window van; and the 2.7 L petrol, that comes only in the window van option. At least some general export market HiAces are powered by the 5L-E 3,000 cc diesel engine. In Japan, Toyota's internet-enhanced GPS and vehicle telematics service called G-Book was made available as an option on all trim packages for both private and commercial uses. The fifth-generation HiAce was launched in the Philippines on June 13, 2005, with D-4D variants, Commuter and GL Grandia, both with manual transmission. In March 2006, the new top-of-the-line HiAce Super Grandia was launched, being the first ever HiAce in the Philippines with a standard automatic transmission. The 2.5 and subsequent 3.0-litre turbodiesel KD engines have a maximum power output of 80 kW (109 PS; 107 hp) at 3,400 rpm and 106 kW (144 PS; 142 hp) at 3,400 rpm and maximum torque of 260 N⋅m (192 lb⋅ft) at 1,600–2,600 rpm and 300 N⋅m (221 lb⋅ft) at 1,200–3,200 rpm respectively. The 2.0 L and 2.7 L TR petrol engines have a maximum output of 100 kW (136 PS; 134 hp) at 5,600 rpm and 118 kW (160 PS; 158 hp) at 5,200 rpm respectively and a maximum torque of 182 N⋅m (134 lb⋅ft) and 243 N⋅m (179 lb⋅ft); both being achieved at 4,000 rpm. In November 2017, the Japanese market Hiace Van and RegiusAce came fitted with the 2.8 L 1GD-FTV engine mated to a 6-Speed automatic transmission generating a power output of 111 kW (151 PS; 149 hp) at 3,600 rpm and 300 N⋅m (221 lb⋅ft) of torque from 1,000 rpm to 3,400 rpm supplanting the 1KD-FTV. On Japan's list of the most commonly stolen vehicles the HiAce currently resides in the first place. Because of a lack of a theft immobilizer, it is fairly easy to steal a HiAce, as opposed to much more valuable SUVs and sports cars, which have more sophisticated theft deterrent systems. As of March 2019[update], the H200 series is still being sold in Japan, even though the H300 series has been released in other countries. The second generation of the RegiusAce was completely restyled and is currently in production. Transmission choices are a 5-speed manual transmission or a 4-speed automatic, with the gearshift lever integrated into the instrument panel so as to allow front seat passengers access to the rear of the vehicle from the inside. A moderate restyle was completed November 2005. The sixth generation of the HiAce made its global debut on 18 February 2019 in the Philippines. It uses a front hood/bonnet arrangement instead of cab-over design hence departuring from the design language of its predecessors. The development of the H300 was led by Toyota chief engineer Takuo Ishikawa. The headlamps and front grille are inspired by the Alphard. Other changes for the new model include new wing mirrors and new alloy wheels on premium models. The changes at the rear include redesigned tail lights and a new tail-gate. The interior changes include a new dashboard with a new steering, Navigation System, instrument panel along with a new HVAC system and cabin with increased seating capacity. The new 2.8-litre 1GD-FV turbo-diesel inline-4 engine is a detuned variant of the engine found in the Fortuner and Innova. The petrol engine range initially includes the 7GR-FKS V6 engine likely shared with the Camry saloon. ^ "自動車ガイドブック [Japanese Motor Vehicles Guide Book 1978/1979]" (in Japanese). 25. Japan: Japan Automobile Manufacturers Association. 1978-10-10: 213. 0053-780025-3400. ^ "Chunzhou Auto". China: Jiangnan automobile Manufacture. 2011-12-24. ^ "JINCHENG MINIBUS". Qinhuangdao Jincheng Automobile Manufacture Co. Ltd. Archived from the original on 2011-07-16. ^ "Kingwin Van - King Long". web.archive.org. 2018-10-06. Archived from the original on 2018-10-06. ^ Faulkner, Author Sam (2018-08-20). "A brief history of Red Star Automotive". ^ "Kingstar Vehicle Co., Ltd". web.archive.org. 2018-05-15. Archived from the original on 2018-05-15. ^ "BEIJING AUTOMOBILE WORKS CO., LTD". web.archive.org. 2016-04-01. Archived from the original on 2016-04-01. ^ "...... Welcome To Tianma Automobile Group!". web.archive.org. 2008-12-30. Archived from the original on 2008-12-30. ^ "Great Wall - Proteus - Mini Bus". web.archive.org. 2019-04-14. Archived from the original on 2019-04-14. ^ "SLK5030,物流车,上海申龙客车有限公司,上海申龙客车有限公司". web.archive.org. 2018-07-19. Archived from the original on 2018-07-19. ^ "Micro Cars Limited". Microcars.lk. Archived from the original on 2013-02-11. Retrieved 2010-07-19. ^ "Toyota Hiace-kundene er lei seg" [Toyota Hiace customers are upset]. Hegnar.no. 2012-05-22. Retrieved 2012-05-31. ^ "Toyota Looks to PSA Peugeot-Citroen and Fiat for its New ProAce LCV". carscoop. Retrieved 2012-10-20. ^ "Jinbei Grace MPV". ChinaAutoWeb. Retrieved 2016-09-20. ^ "Affiliates (Toyota wholly-owned subsidiaries)-Toyota Auto Body Co., Ltd". Toyota Motor Corporation. 2012. Retrieved 2015-05-01. ^ โตโยต้าเดินเครื่องปั้นคอมมิวเตอร์ในไทย18,000คัน. Siamsport (in Thai). 2013-01-10. Archived from the original on 2013-12-12. Retrieved 2013-11-22. ^ โตโยต้า ลุยผลิตรถตู้ ไฮเอซ คอมมิวเตอร์ แทนนำเข้า. Manager Online (in Thai). 2013-01-12. Retrieved 2013-11-22. ^ "Toyota Caetano Portugal: Assembly of Toyota Comercials (sic)". Grupo Salvador Caetano. Retrieved 2011-02-04. ^ "Chery Rely H3 MPV - ChinaAutoWeb". chinaautoweb.com. ^ sgCarMart. "Car Review - Chery H5 2.0 (M)". sgCarMart.com. ^ "Chery Rely H5 MPV - ChinaAutoWeb". chinaautoweb.com. ^ "Model - Transcom". cheryinternational.com.my. ^ "H6C-Van-Sitename". 2016-11-27. Archived from the original on 2016-11-27. Retrieved 2018-03-26. ^ "H5C-Van-Sitename". 2016-12-29. Archived from the original on 2016-12-29. Retrieved 2018-03-26. ^ "KLQ6540-Van - Products - HIGER BUS Company Limited". 2017-03-04. Archived from the original on 2017-03-04. Retrieved 2018-03-26. ^ "JinBei Haise Website,2004 version". web.archive.org. 2006-10-27. Archived from the original on 2006-10-27. ^ "Brilliance Jinbei Haise Mini Bus - ChinaAutoWeb". chinaautoweb.com. ^ "HuaChen Group Auto". web.archive.org. 2012-10-06. Archived from the original on 2012-10-06. ^ "HuaChen Group Auto". web.archive.org. 2013-04-25. Archived from the original on 2013-04-25. ^ "Placer-X". Sendok Group. Retrieved 2016-03-29. ^ "Qinhuangdao JINCHENG Automobile Manufacture Co., ltd". 2016-03-21. Archived from the original on 2016-03-21. Retrieved 2018-03-26. ^ "Kingo Minivan". 2015-01-31. Archived from the original on 2015-01-31. Retrieved 2018-03-26. ^ "Van, New Energy Bus, Kingwin Series Van". 2017-10-04. Archived from the original on 2017-10-04. Retrieved 2018-03-26. ^ "New Kingwin Van - Light-duty Bus - King Long". web.archive.org. 2019-04-14. Archived from the original on 2019-04-14. ^ "View Traveller - FOTON". ^ "View TransVan - FOTON". ^ a b Orlove, Raphael. "These Are China's Most Shameless Knockoffs". Jalopnik. ^ CO.LTD,, Zhanjiang Kingstar Vehicle. "NEPTUNE - 16 Seats Light bus - Kingstar Vehicle Co., Ltd". www.kingstar.com.cn. Archived from the original on 2018-03-20. Retrieved 2018-03-20. ^ CO.LTD,, Zhanjiang Kingstar Vehicle. "NEPTUNE - 19 Seats Light bus - Kingstar Vehicle Co., Ltd". www.kingstar.com.cn. Archived from the original on 2018-03-20. Retrieved 2018-03-20. ^ CO.LTD,, Zhanjiang Kingstar Vehicle. "PLUTO - 16-19 Seats Light bus - Kingstar Vehicle Co., Ltd". www.kingstar.com.cn. Archived from the original on 2018-03-20. Retrieved 2018-03-20. ^ CORPORATION., TOYOTA MOTOR. "トヨタ ハイエース バン | スペック・装備 | トヨタ自動車WEBサイト". toyota.jp (in Japanese). Retrieved 2017-12-03. ^ Filipponio, Frank (2008-11-20). "Japan's most stolen vehicle is... not what you think". AutoBlog. US. Retrieved 2019-01-06. ^ "Bangkok 2019: New Toyota Commuter passenger van". 2019-04-01. ^ a b "Toyota's New Hiace Series for Overseas Markets Debuts in Philippines" (Press release). Manila, Philippines: Toyota Global Newsroom. 2019-02-18. Retrieved 2019-02-18. ^ "Toyota Premieres All-New HiAce in the Philippines" (Press release). Philippines: Toyota Motor Philippines. 2019-02-18. Retrieved 2019-02-18. ^ De Guzman, Marcus (2019-02-18). "World Premiere in PH: 2019 Toyota Hiace starts at PhP 1.590 million". Auto Industry News. Philippines. Retrieved 2019-02-18. ^ Davis, Brett (2019-02-18). "2020 Toyota HiAce revealed, gets powerful V6 option". PerformanceDrive. Australia. Retrieved 2019-02-18. Wikimedia Commons has media related to Toyota HiAce.